This chapter provides a conceptual discussion about the interaction between information and communication technologies (ICT) and the learning society. It focuses on the importance of knowledge and social capital building as key stones of the connected learning society, which is built upon online networks. This chapter also highlights the role of lifelong learning in the connected learning society as an instrument which can support flexicurity policies in the labor market. 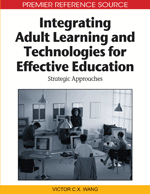 This work follows the common argumentation logic that the introduction of ICT usually leads to a change in lifelong learning opportunities, which are playing an especial role in achieving economic, employment and social goals. In the connected learning society, how technology is being used will ensure the continual adaptability and employability of workers. Learning has always been essential for humans through information transfer, collaboration and social capital building. In today’s world, the continuing-education demands of a changing workforce and the accelerated pace of technological change have increased demands for continuing education and lifelong learning (LLL), a concept that has be defined as “the process of intellectual and professional renewal that leads to both personal enrichment and occupational growth” (Kellogg Commission, 1999, p. 23) or as “all learning activity undertaken throughout life, with the aim of improving knowledge, skills and competences within a personal, civic, social and/or employment related perspective” (European Commission, 2001, p. 9). Lifelong learning is also seen as one of the central means of challenging the exclusion of people with learning difficulties (Riddel, Baron, & Wilson, 2001) and, as a tool for improving labor force mobility, both between jobs (job mobility) and within and between countries (geographic mobility). As population ages, Bork (2001) pointed out that “lifelong learning, including adult learning, will be the tail that wags the dog” (p. 195). Nowadays, the need for economic development fosters the importance of LLL in political institutions, firms and workers agendas. The Action Plan for Skills and Mobility, adopted by the EC in February 2002 and endorsed by the Barcelona European Council in March 2002 was principally designed as a contribution to achieving the Lisbon objective of more and better jobs, greater social cohesion and a dynamic knowledge-based economy. In the 90s, lifelong learning established itself in Europe as a public policy in response to the problems of increased unemployment (Žiljak, 2005). Due to our current economic crisis, the worst financial crisis since the Great Depression, some economists expect the economy to undergo painful structural transformations. In that sense, this last economic crisis should be seen as an opportunity to think afresh about technology and the learning society. More than ever, we need a global learning society with learning available to all. Information Communication Technology (ICT) will play an important role in supporting the future of the learning society. Investment in education and training is defined as essential to increase human and social capital. From the point of view of the Human Capital Theory, the benefits of investment in human capital are set out (Schultz, 1961): where returns to other forms of capital are constant or decreasing, the development of human capital, primarily through education and training, will constitute the prime source of economic growth. But, today, the current global economic meltdown is affecting national education budgets and firms’ investment in training and human capital development. Although the full impact is yet to be determined, one thing is clear: LLL is an increasingly crucial factor both for the competitiveness of nations and firms and, for the long-term employability of workers because LLL strengths a country’s workforce and its economic productiveness (Gorard & Selwyn, 1999). These ideas are supported by the Employment in Europe Report 2006 (European Commission, 2006), which clearly states that “high participation in lifelong learning is positively associated with high employment and low (long-term) unemployment.” (p. 108). In a context of labor market changes and growing threats for the working population, the term flexicurity is gaining acceptance, especially among European countries. Flexicurity can be defined as an integrated strategy to enhance, at the same time, flexibility and security in the labor market. Flexibility, on the one hand, is about successful moves (“transitions”) during one’s life course. The dimension of (income) security is related to the various features of unemployment benefit systems and their interaction with active labor market policies. So, flexicurity can be implemented across four policy components: 1) flexible and reliable contractual arrangements; 2) effective active labor market policies, 3) social security systems and, 4) comprehensive lifelong learning (LLL) strategies to ensure the continual adaptability and employability of workers.